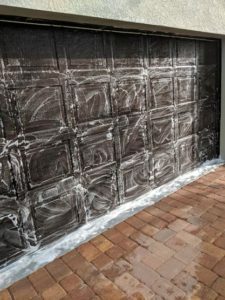 I’ll bet your idea of how to clean your garage door is hosing it off once a year if it looks dirty. There’s a bit more to it than that, especially if you’ve got a chalky garage door like the one below. One of the craziest parts abut becoming a homeowner was all of the maintenance that comes along with the house. I’ve already written a quick guide on how to lubricate your garage door, so that will keep the door in tip-top working shape. Cleaning your garage door can be just as quick and easy. How should you clean your garage door? Use a regular garden hose to wash off any loose dirt or dust. Don’t use a pressure washer! That’s the basic steps, but first let’s get some important do’s and don’t out of the way. Your garage door is exposed to the same stuff that your car is: wind, rain, snow, dust, dirt, bugs, and more. All of them can damage the surface of your paint and start eating away at the surface below. So it makes sense that your garage door needs the same attention. That means both a wash to get rid of the junk that’s accumulated on it and a wax to give it a protective coat. People always give me funny looks when I say this. Did you know that every major garage door manufacturer recommends waxing your garage door at least once a year? It adds a protective coating which enhances the door’s finish and keeps it from getting damaged or faded by the elements. Obviously this is only going to be for metal and fiberglass doors. If you’ve got a wooden garage door, it’s not going to make much sense, right? Choose a type of wax depending on where you live. Most areas of North America can use a spray car wax like Meguiar’s Ultimate Quik Wax, which is the same thing I use on my car. If you live near the coast and have a lot of salt brought in from the ocean, Meguiar’s also makes a “Marine and RV” wax, but I’ve never used it. Once I get that house on the beach I’ve been dreaming about, I’ll switch over. Do: Clean your weather stripping as well! The weather stripping around your garage door forms an insulating seal to help keep the elements out of your garage. You may not notice it as much as your door’s exterior, but it’s is an important part that needs attention too. You’ll want to use a general purpose cleaner to wipe off any dirt or grease that’s accumulated. Now’s also a good time to inspect the weather stripping for cracks or other damage. The “Don’ts”: Never do these! Don’t: Never use a pressure washer! I get it. Pressure washers are COOL! I got one and immediately started cleaning stuff because it’s quick and easy. There’s a lot of cool ways to use a pressure washer, but you should never use one to clean your garage door. Pressure washers are great for getting caked on dirt, stains or algae off of very hard surfaces (like your sidewalk). Even if you use a pressure washer with a 40-degree nozzle, you have the potential to damage your door or the weather stripping. 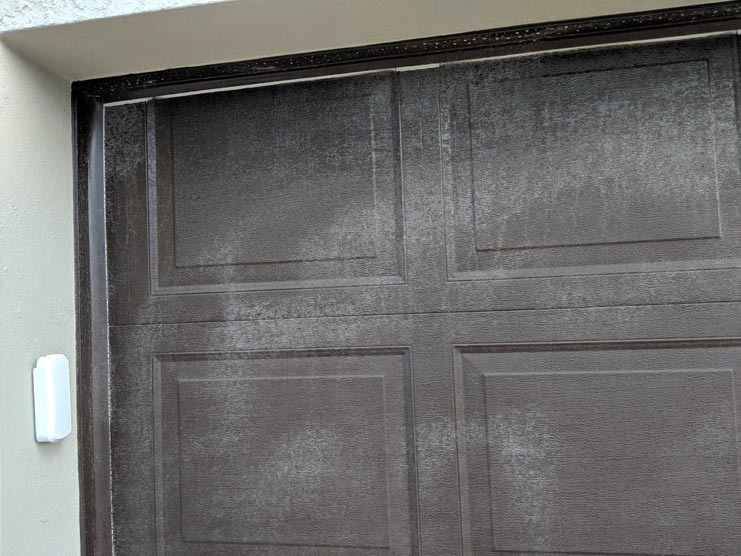 Every major garage door manufacturer specifically says not to use a pressure washer because it will potentially damage your door and void your warranty. 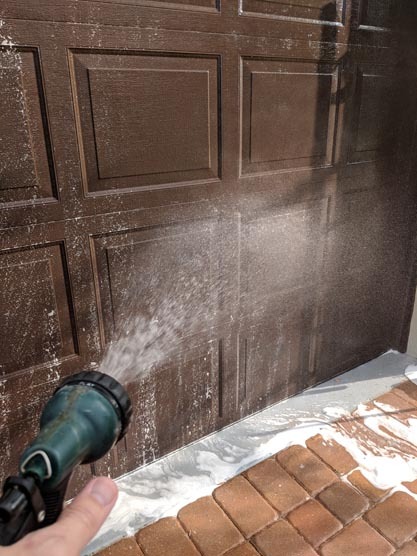 Plus…if you’re following along and washing your garage door at least twice a year, you shouldn’t have anything stuck on there that needs a pressure washer to get off. Especially if you live in the South like me, this is a must. If you can clean your garage door early in the morning or in the afternoon\early evening, it’ll make your job a whole lot easier. 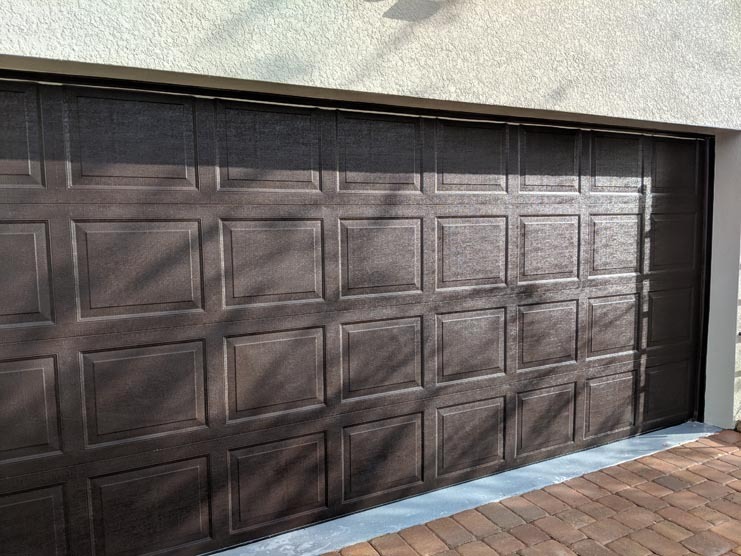 Your garage door is the biggest non-insulated surface in your house, so it traps heat – especially if you have a dark colored door like I do. If the door gets too hot, it’ll actually start breaking down the chemicals in the soap and wax as you’re applying them. That leads to the “chalky garage door” look that we’re trying to avoid. I have to throw this in there because my mother is the type of person to use pure bleach on everything. Not much can match the raw cleaning power of pure bleach, and to her, that makes it her go-to cleaning product. There’s only one problem: it’s extremely harsh. My mom has bleached things so many times that she’s literally burned off her fingerprints. Imagine what that could do to the protective finish, or worse, the paint on your garage door. It shouldn’t take more than fifteen minutes from start to finish to clean your garage door. It’s a simple process, so just follow these easy steps and you’ll have a great looking garage door year-round! Cleaning your garage door is much the same as cleaning your car. You’re going to need a couple of basic supplies, that you probably already have in your garage. 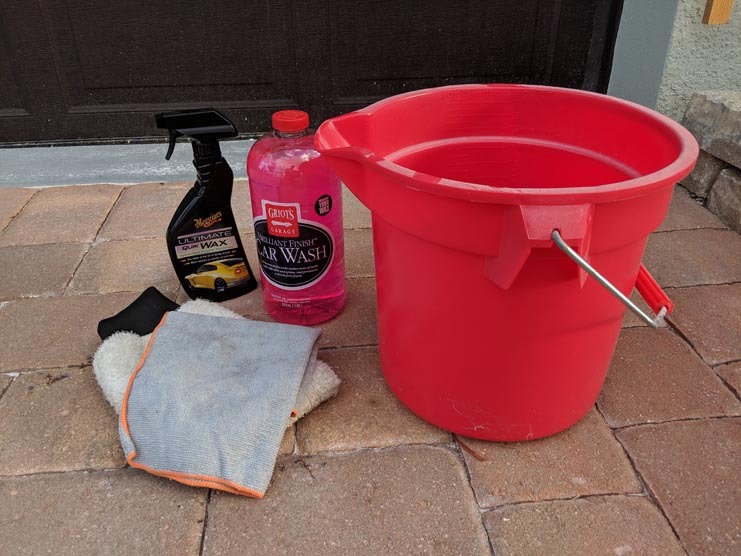 Clean 3-5 gallon bucket: It’s a good idea to have a specific bucket for washing your car and garage door. You don’t want to mix any other chemicals with your soapy water. It kind of defeats the purpose of washing the door. 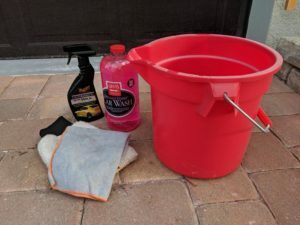 Sponge or mitt: You can use something simple like a large sponge to apply the soap to the door, but I prefer using a washing mitt. You can pick up a microfiber, wool or sheepskin wash mitt for between $5-$10 and it’ll last you for years. Car wash soap or dish soap: Personally, I like car wash soap. Dish soap is designed t take “grease out of your way”, which isn’t necessary here. If you have a lot of grease (oil, WD-40, etc.) on your door, then go ahead and use something like a Dawn dish soap. Otherwise, car wash soap is fine. Liquid spray wax: Do yourself a favor and never use paste wax. My fiancee tried to use paste wax to clean our garage door and the wax was drying and caking on before she could get to wipe it off. Most garage doors are textured, so a spray wax will help get into the nooks and crannies of your door. Even though you’re not going to use a pressure washer, you still want to get all of the loose dust and dirt off the door before you soap it down. If you skip this step and go straight to applying soap with a sponge or mitt, then you may end up just pushing the dirt around the door. That can damage the door’s finish. Rinse off the door and the surrounding weather stripping and door trim with a medium-strength spray. As you can see from the picture, I’m not using the “Jet” setting on my hose here. The object here is just to get the big stuff and let the soap do it’s job. Apply the car wash soap with your sponge or washing mitt. Start at one of the top corners and work your way across the door, before working your way down the door. If your door is blocked into rows of squares like mine is, this is easy. I started on the top left corner, working my way across that row before moving down and working my way back across the second row. Remember your Karate Kid training here. Circular motions (wax-on\wax-off) will be the most effective. Use the same nozzle setting that you used to pre-rinse your door in Step 2. You don’t need a powerful spray here. You’re just trying to get the soap off the door. Now’s a good time to see if you missed any spots or if you’ve got any stubborn dirt or stains that need some extra attention. Depending on what spray wax you use, you may need to dry your garage door before you wax it. Some spray waxes can be applied when still wet, so check the instructions to be sure. Grab a clean, dry cloth and your bottle of spray wax. Use the same process as you did for applying soap. Start at one of the top corners and work your way across the door, before moving down a row and starting back the way you came. Use circular motions with your cloth. This not only removes any excess wax, but will help polish your door as well. This is the step that almost everybody ignores…but not you, right? The weather stripping around your garage door helps to keep the air inside your garage comfortable and all of the bugs and the elements outside where they belong. Use a general purpose cleaner and go over the weather stripping around the garage door’s edges, as well as the rubber seal on the bottom of the door. While you’re cleaning, inspect for any cracks or tears. If you find them, take care of them. Once the weather stripping is cracked, it needs to be fixed or replaced as soon as possible.